Blockchain has become well-known because of its use with Bitcoin, but there are several lesser known applications of Blockchain and Distributed Ledger Technology (DLT). This Refcard focuses on how you can use DLT and Blockchain in combination with PDFs to write applications. Learn how to reduce the complexity of your code when needing digital signing and verification functionality, assure the integrity and authenticity of a document, and automate your document-oriented workflows. The records can be replicated over multiple nodes in a network (decentralized environment). New records can be added by each node, upon consensus reached by other nodes (ranging from one specific authoritative node to potentially every node). Existing records can be validated for integrity, authenticity, and non-repudiation. Existing records can't be removed, nor can their order be changed. The different nodes can act as independent participants that don't necessarily need to trust each other. Blockchain is a type of DLT in which records are organized in blocks that are appended to a single chain using cryptography and distributed consensus. Each block contains a time stamp and a link to the previous block. This ensures that data in any given block can't be altered retroactively without the alteration of all subsequent blocks. This approach makes blockchain technology a good choice for the recording of events, records management, provenance tracking, and document life-cycle management. Some platforms, such as Ethereum, allow developers to build and use decentralized applications running on blockchain technology. This is done using smart contracts. A down payment of 50% of the total cost is required before a work of art is shipped. Upon delivery of the work of art, full payment of the remaining 50% is automatically processed. The blockchain will receive events, such as a record that shows a down payment or a record that notifies a delivery. These events trigger the execution of the smart contract, resulting in a shipping order or the processing of a payment. Settlement can happen off-chain or on-chain. We talk about off-chain assets in the case of value-bearing items residing outside of the blockchain; for instance, a physical object such as a painting or a statue. This object usually has a digital counterpart in the blockchain. An RFID tag could be attached to each work of art with an ID that refers to a blockchain record. This allows the object's lifecycle events to be mirrored in the blockchain. For instance, when a work of art changes hands, the blockchain could keep track of its rights and document the owner's claim to it. We refer to on-chain assets when the assets are actually on the blockchain; for instance, the payment is done using Bitcoin. Not every agreement can be captured in code. For instance, you can't program a marriage certificate. In a public blockchain, aliases are used and info can be encrypted, but that's not 100% waterproof. All data stored in a public blockchain is eventually public. In a private blockchain, there's more security, but not all participants in the blockchain are necessarily trusted. There may be use cases where even a private blockchain doesn't provide sufficient protection. Blockchain isn't meant to replace other types of databases and storage: you typically won't store a document in the blockchain because of its potentially large file size and its potential confidential nature. 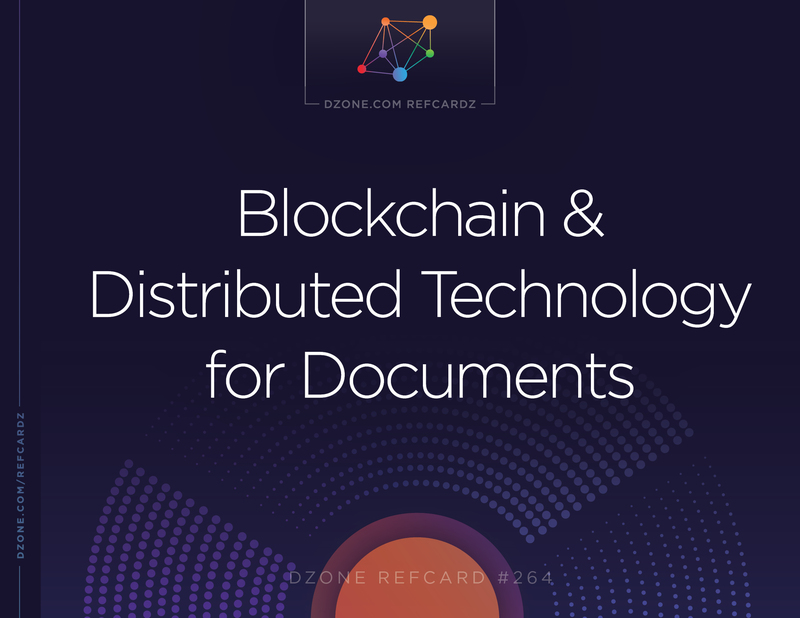 In this ref card, we're going to discuss a solution where the off-chain asset isn't a physical object, but a document stored outside of the blockchain as a PDF file. Since ISO 32000-2 (the PDF 2.0 specification), it is mandatory for every PDF file to have a unique ID. This ID consists of two parts. When a PDF is created from scratch, the two parts are identical. When the document changes, the first part is permanent, whereas the second part changes to ensure the uniqueness of the ID pair. This concept allows different documents with different ID pairs that have the first part of the ID in common to be identified as documents that are related to each other. We'll use the ID pair of a PDF file, the "off chain" asset, as the primary key for the "on chain" record in which we'll store a signed hash of the document, along with some metadata. By doing so, we can solve a series of common problems with documents. Integrity: If hash1 equals hash2, we know that the document hasn't been tampered with. Authenticity: we know who signed the document, since this information is present in the public certificate of the signer. Non-repudiation: the signer can't deny that he signed the document, because he's the only one who is supposed to have access to his private key. If we also want guarantees about the time of signing, we need to involve a time stamping authority; if we want the signature to be valid on the long term, we need extra long-term validation (LTV) functionality. If you want people to trust the signatures in your document, you need to involve some central authorities, such as CAs and TSAs. It would be great if we could think of a system that doesn't require any central authorities. LTV is a cumbersome process that relies heavily on central authorities. Suppose that you've kept a signature alive for a century, and you discover that you can't extend the life of the signature because of a sudden, perpetual unavailability of one of the central authorities that were involved. That's problematic. For all of these reasons, the adoption of digital signatures in PDF has been slow. The functionality was too complex. When PDF documents aren't signed, you never know if they can be trusted. PDF documents are consumed offline, so there is no green checkmark or padlock informing you that the document was served using the HTTPS protocol, nor any indication whether you can trust the author of the document and the domain from which it was obtained. Furthermore, if you don't have a copy of a document, but you do have its original URL, you can encounter the problem that the link doesn't work anymore because the document was moved. We call this link rot, and there are centralized services such as doi.org that provide a Digital Object Identifier (DOI) that allows you to retrieve one or more currently active URLs to a resource based on the resource's ID. DOI allows you to register and maintain the location of a document for a fee. Wouldn't it be great if we could reduce that fee, and decentralize the service? We can solve all of these problems, and probably even some problems we didn't even know we had, by introducing blockchain into the world of PDF documents. Signing a document would involve creating a hash of the document, signing that hash with a private key, and storing that signed hash in the blockchain along with the corresponding public certificate. In this case, we use blockchain as a database for storing signatures with the unique ID of the PDF as the primary key for each record. Optionally, we can add metadata to the signature records, such as the status of the document (draft, final, unpaid, paid,...) and one or more locations (e.g. the URLs of different mirrors from which the document can be downloaded). As a developer, you get a lot of advantages by using this approach. You need to be less of a PDF expert: you don't need to worry about incremental updates, about which changes are or aren't allowed to the document, and so on. On the Blockchain side, you have control over the application (e.g. which metadata to store, which blockchain technology to use), but by using the API explained in this ref card, all the gritty details about how to query the blockchain will be abstracted away. Furthermore, you get automatic distribution of the signatures and metadata, load balancing, scalability, and security without having to write any code specifically for that purpose. The address of the relevant blockchain could be stored in the metadata of the PDF. You can use this address to retrieve the record (or records) that correspond with the ID-pair of the document you want to verify. That record will give you information on the signer or signers. With the hash, you'll be able to verify the document's integrity. If more than one record is retrieved, you'll have a historical overview of who registered the document when, and you can inspect the metadata that was added with each registration. What are the Advantages of Such an Approach? When discussing different use cases, you'll notice that we'll often talk about "registering a document" instead of "signing a document." Sometimes, we don't want the document to have a legally binding signature. Fot instance, you might want to register an intermediary draft of an agreement that is being negotiated in the blockchain, but you don't want that contract to be legally binding until it has been finalized and approved by all parties. In some sectors, people won't accept the fact that we store a signed hash in the blockchain as a valid signature, e.g. because the government doesn't accept such a signature as legally binding. Even in those cases, it makes sense to store hashes of documents along with some metadata in the blockchain. You can retrieve the records of a document based on its ID pair to inspect the metadata added by the person who registered the document. For instance: a document that is registered as an invoice with status "unpaid" by the CRM system of a vendor, can be registered as an invoice with status "accepted" by the ERP system of a buyer, and eventually be registered as an invoice with status "paid" by the buyer's bank. If you find a document in the wild, e.g. a draft of a technical specification, and you want to know if that document is the latest version, you could search for a record that registers a more recent version of that draft, and use the location information stored in that record to retrieve that updated version. With the open source iText 7 pdfChain add-on, creating a blockchain record containing a signature of a PDF file is pretty straightforward. The pdfChain add-on is blockchain-technology agnostic. You need to implement the IBlockChain interface, or pick an existing implementation to match with the blockchain technology of your choice. You also have to extend the abstract class named AbstractExternalSignature. A method to put a record on the blockchain. A method to get a record from the blockchain based on its key. A method to list all records registered on the blockchain. The Record class simply extends Map<String, Object> and is used as a collection of key-value pairs. A method in which you provide the hash algorithm to be used. A method in which you provide the encryption algorithm to be used. A method in which you provide the public key object. A method in which you provide the private key object. The DefaultExternalSignature class currently uses SHA-256 as hashing algorithm and RSA as encryption algorithm. Using an IBlockChain implementation and an external signature class, we can create a PdfChain object that can be used to add and retrieve records from the blockchain. The get() method returns a List of Record objects, because the same document can be stored more than once, with different properties. As you can see, the PdfChain class stored an entry with a key named confirmations. That's extra metadata that we stored in the blockchain using the PdfChain method. We can use the BQL functionality of the pdfChain add-on to create a query. For instance, we can use the BQLCompiler to get the ID-pair, the number of confirmations, and the hash value of all the records of which the number of confirmations is greater than 10, but lower than 50. 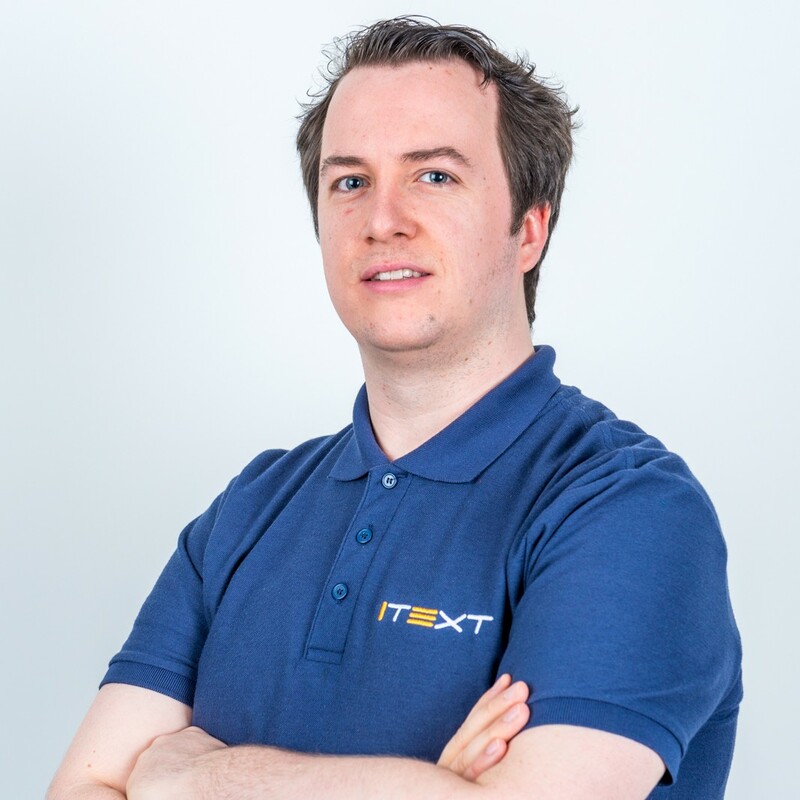 For more examples and more info about the classes used in these examples, see https://itextpdf.com/Blockchain. The public certificate of the vendor. The hash of the document signed by the vendor. There's no need to store the amount to be paid, the identity of the buyer, nor any other invoice detail, as that could be a breach of privacy. If the invoice isn't registered in the blockchain, it could be a fake invoice. The customer could decide not to pay the invoice until it's officially registered. If the hash is signed using a key issued by an official instance, the customer can check if the vendor is who he claims to be, and if that vendor has the appropriate licenses to sell goods or services. A vendor can't backdate invoices anymore, as there will always be a timestamp of the registration in the blockchain. A customer will immediately see if an invoice was forged, for instance if the invoice was intercepted and the wiring information was changed. The IRS could check how many invoices were issued by a company. If a company declares only 800 invoices, but the IRS finds a 1000 invoice registrations in the blockchain, there's a problem. The IRS could check if all paid invoices paid for by a company were actually registered in the blockchain. If a company declares a 1000 paid invoices, but 200 aren't accounted for in the blockchain, there's a problem. Not all invoices have to be verified for integrity; a sample check might be sufficient for tax purposes. Invoices are merely a first step, we could use the principle for every document in the sales workflow. A document that starts off as a quote request can spawn different quotes being issued by different vendors. After examining the different quotes, one quote could be chosen and result in a purchase order. That purchase order can then fork into an invoice and a delivery note. A bank that processes the invoice can mark the invoice as paid. The different nodes in this simplified figure represent CRM and ERP systems at different companies. Each time an invoice leaves the CRM at the vendor, that invoice could be registered automatically in the blockchain. When this invoice is received in the ERP system on the buyer's side, it can be validated in the blockchain before it is sent to the bank to process the payment. Once the bank marks an invoice as paid, the CRM of the vendor will notice this immediately when the block containing a record created by the bank reaches the CRM's blockchain client. Signing a PDF document in the blockchain instead of storing a signature in a PDF reduces the complexity of the code for a developer who needs digital signing and verification functionaliy. The same principle can be used in many other use cases to implement a document workflow, to keep track of the location of a document, and much more. Software integrators can introduce the pdfChain add-on into Document Management Systems (DMS), Customer Relationship Management (CRM) and Enterprise Resources Planning (ERP) systems. They can add the pdfChain add-on on top of storage solutions and secure document vaults. The blockchain will help them keep track of those documents, and inherently provide digital signature functionality. Blockchain Fundamentals: How Does It Actually Work? Give us assurance about the integrity and the authenticity of a document. Nanage different versions of a document. But first, let's introduce some basic concepts. We'll use the ID pair of a PDF file, the \"off chain\" asset, as the primary key for the \"on chain\" record in which we'll store a signed hash of the document, along with some metadata. By doing so, we can solve a series of common problems with documents. When discussing different use cases, you'll notice that we'll often talk about \"registering a document\" instead of \"signing a document.\" Sometimes, we don't want the document to have a legally binding signature. Fot instance, you might want to register an intermediary draft of an agreement that is being negotiated in the blockchain, but you don't want that contract to be legally binding until it has been finalized and approved by all parties. In some sectors, people won't accept the fact that we store a signed hash in the blockchain as a valid signature, e.g. because the government doesn't accept such a signature as legally binding. You can retrieve the records of a document based on its ID pair to inspect the metadata added by the person who registered the document. For instance: a document that is registered as an invoice with status \"unpaid\" by the CRM system of a vendor, can be registered as an invoice with status \"accepted\" by the ERP system of a buyer, and eventually be registered as an invoice with status \"paid\" by the buyer's bank.